ENG: Normally I prefer to wear black leather jacket during the whole spring, but this time rules are changing. Colorful bombers and outwears will bright up days and make my outfits look different. Have a nice positive day and keep smiling! RU: Обычно все весну я хожу в кожаной косухе и не признаю другие варианты одежды. В этом году все меняется: начинаю активно запасаться различными цветными жакетами и прочими яркими радостями. Кроме этой стеганной курточки, хочу еще пару бомберов. Наслаждайтесь весенней погодой! Жакетик -чудо! Яркий и по весеннему позитивный! Очень понравился! Удачного дня! Целую! The jacket is great especially now that I see it in a bigger photo! The jacket is beautiful with the print. I like the combination you've done. Perfect jacket and shoes! Great casual outfit! Здоровская куртка и макияж красивый! P.S. В начале текста опечатка вместо "всю" - "все". Super! 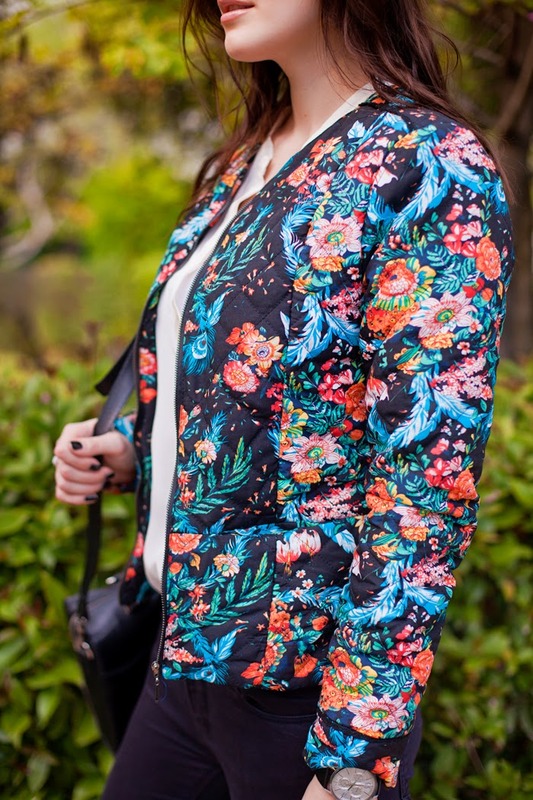 I couldn't agree with you more, cheers to floral jackets! Really so nice as always. Super stylish honey, love everything. очень красивый получился образ) курточка - шикарна! I'm in love with all the oufit!!!! shoebox-kicks IS A Worldwide ONLINE Design RETAILER OFFERING A great many STYLES Crosswise over WOMENSWEAR AND MENSWEAR With the goal that YOU Remain In front of THE Patterns. SHOES, HANDBAGS, WATCHES SHOP OUR Tremendous Scope OF WOMEN'S Form Things INCLUDING DRESSES, TOPS, KNITWEAR, COATS, ONESIES, SHOES, Embellishments. YOU Need IT – We Have IT! WE Dispatch NEW STYLES Each DAY SO WHATEVER YOU'RE Searching FOR, BOOHOO IS day in and day out Form Taking care of business. WE ARE US. WE ARE shoebox-kicks. more write-ups as these help us a lot and such articles add on to our knowledge. Thank you! Wow! I really appreciate the fact that you have written on topic and made it so clear, it is a different topic and very less people can write in a manner that everything gets clear. Also, I love the layout of your page and the images used are very attractive. Wants to know about Freddie Prinze Jr net worth? Click Here To read latest article.